Blake Shubert's bone marrow could be a match for a patient. On Sunday, for the 16th straight April, coach Andy Talley and his Villanova football program will take part in something special, even though it won't help the Wildcats win any more games next season. It's much more significant than that. Because it's one of those rare times in athletics in which it truly is a matter of life and death. "We all do what we can in our own little world," Talley said. "We're trying to make the ultimate difference." 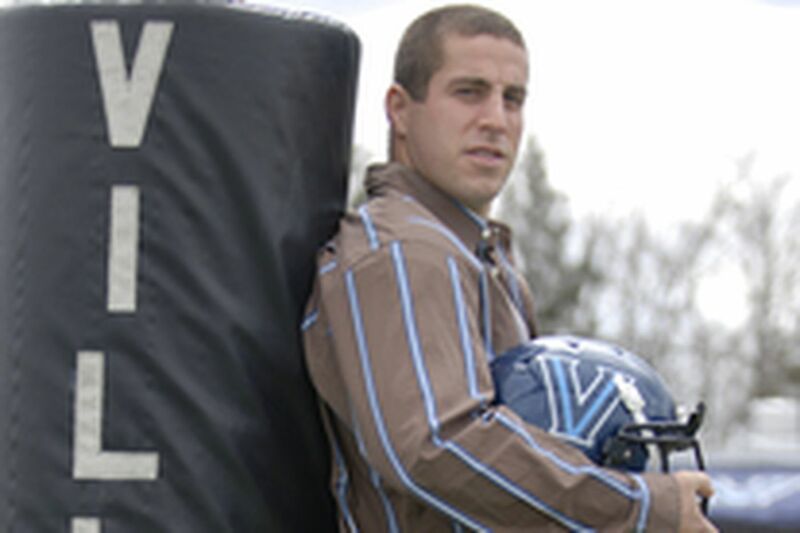 Talley started the Villanova Football Bone Marrow Testing Program in 1992. Years ago, one of his players was found to be a DNA match and became a donor. His only stipulation was, he wanted it kept anonymous. Last fall, placekicker Joe Marcoux gave his marrow to a 53-year-old mother of three. It won't be known for roughly another 6 months whether the transplant was successful. Still, he was the only chance she had. Now, it appears as if it could be Blake Shubert's turn to help a cancer patient who has nowhere else to turn. A linebacker from Fairfax Station, Va., he's set to graduate next month with a degree in management. Like almost every football player who suits up on the Main Line, he registered to be a donor as a freshman. It used to involve giving a blood sample. These days all it takes is a cheek swab. Nearly 3 weeks ago, Shubert received a call to tell him he was a match for a 28-year-old female. He thinks she has children, but he's not certain. What he does know is the doctors have to do more tests to make sure he's indeed the one. He expects to hear back from them soon. If they're right, he'll have to go through a several-hour procedure in which he lies in a hospital bed, with his arms outstretched, while the marrow is extracted. It also involves about a week of properly prepping the body, a process that left Marcoux feeling a little nauseous. "We take worse hits on the football field every day than having a needle put in me," Shubert said. "We're talking about someone's life. You never think you're going to get called, because the odds are so great. But if they do, how can you back out then? What if I was the one who needed somebody's marrow and they wouldn't go through with it? That's the only way you can look at it. "I don't care what's involved. It's worth it. I'll get over it. I'm not even worried about it. It's about making a sacrifice, doing the right thing. My dad was a [law-enforcement] guy. I thought about joining the military. Now I get a chance to save someone's life, fulfill everything I've dreamed of. I can understand why some people would be afraid. But that's not me. It's the most unselfish thing I can think of." So far, Talley's efforts have placed the names of some 3,500 potential donors on the international registry list of 20 million total. It's still not nearly enough. About 250 matches are found each year, making it a 1-in-80,000 proposition. "It's been harder than I thought it would be," Talley said. "What happens is, a lot of people, when they're called back for a second test, over time we've found out that a lot of them don't want to do it. They start thinking about what's involved. But the reality is, it's not a lot, when you're talking about someone's life. We need more education and awareness. It's an ongoing battle." Talley asks each of his 65 players to bring 10 people to register, which takes about 10 minutes. In the end, he winds up getting about half of those who originally commit. But anyone can do it. All you have to do is be between the ages of 18-60, and show up at Jake Nevin Field House on Sunday afternoon from 1 to 4. It's that simple. And there's no need to ever register again. Chances are you'll never get called back. Yet if you do, you'll never experience anything like it. Giving doesn't get any better. "It's the only chance this person has," Shubert said. "There's a family out there that's really struggling. You have to see it from her perspective. My personal view of life is, it's the Christian thing to do, the American thing to do. People keep telling me they're proud of what I'm doing, but I haven't done anything yet. I kind of feel bad, because I want this to work out for her. I'm definitely anxious . . .
For information, contact the Villanova football office at 610-519-4105.